From fledgling startup Aerials to Deep Elm signed project Lights & Motion, Christoffer Franzén has been through a lot trying to release his music to the public. However, there's a certain satisfaction in having discovered the project when he was releasing demo tracks on his SoundCloud, and helping nurture and provide attention for the guy until he was finally noticed. And being noticed allowed Franzén to focus his sound and perfect exactly what he wanted to perfect, because L&M's debut is stunningly spectacular. 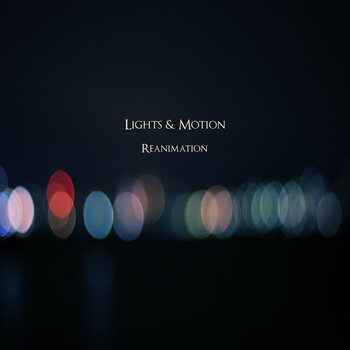 Reanimation is the ultimate cinematic post-rock record, combining beautiful layers, powerful and meaningful melodic lines, and an ethereal feel that drives home the statement Lights & Motion has to offer: "I'm here, and I'm a musical force to contend with." While Franzén had been demoing as Aerials, he came up with some stellar tracks; some of these, in fact, fans will see transferred from the Nowhere EP directly; others, however, were either altered or changed. For example, Aerials' "Airwaves" themes have been noted, but the track itself does not appear on Reanimation. Another interesting little switch-around is the Lights & Motion track "Aerials," which is the Aerials track "Lights And Motion" reworked. An outwards, melancholy cry will be heard from Aerials fans, I'm sure. Getting into the music of Lights & Motion, one can hardly describe it as anything but cinematic. "Texas" is such an easy going, laid-back track that if you were externally feeling any stress, by two minutes into the track it would have dissolved into nothingness. Franzén always has orchestrations that are particularly powerful, but I think the most impressive part of this track was the inclusion of things like guitar bends and shaker, a technique and instrument respectively that would not normally be heard on a post-rock record. Yet, listening to the song, I don't think I could imagine the song without them, because Franzén nests them so delicately deep into the track that without them, the homely-emotion of the song would be completely lost. And when you hear them, along with everything else in the track...it's hard to hear it and not be nostalgic, even on the first listen. Tears will be shed, dear listener. Others might disagree, but I think "Drift" is the most powerful track on the record, both in terms of tempo and song layering as well as emotional burden. The song is introduced with warm, reverberating chords from a guitar, and after a few long notes, a sudden drum and bass line appear, powerful and articulate, and Franzén continues to pile on the instrumentation as synths, more guitar chords, synth strings, and a multitude of others make their appearances, layering and layering in a whirlwind of blending colors and chaos, until only a piano is heard, beginning the famous mid-song post-rock buildup, again with the bass and drums, again with the layers, and the song breaks into a glorious outro, touching on every possible human replication of sadness with what has to be every possible rock instrument known to man. It concludes quickly after this, ending with angriest non-metal guitar breakdown I've ever heard, cutting off sharply and leaving the listener in epic silence. From what I can tell, Reanimation has little room for improvement. Franzén poured his musical and technological genius into this album, playing and mixing and mastering his heart out and putting forth his entire self into his debut. What really shocks me is that he'll probably end up doing it again, but that's for another time. For now, we have Lights & Motion's Reanimation, and it's more than enough to satisfy the hungry Moonlit Sailor or Goonies Never Say Die fan for a while yet. This album was just released today! Go to Deep Elm Digital to listen to it for free and Lights & Motion's Facebook page to tell Chris how much you love his new record. "Drift" is probably my favorite track on the album. Very very awesome review, too. I can't even hate you for blocking me from reviewing it. This album is a great way to kick off 2013, though. I love Deep Elm.